In 1973, the movie-going public went somewhere it hadn’t really been before: The heart of Hell on Earth. They went via the medium of film; in particular, the movie “The Exorcist”. In a time when cinema taboos were being broken on an almost daily basis, this movie still managed to shock and repel millions with its raw view of demonic possession. The film’s theme – an innocent young girl possessed by the vilest and most blasphemous of demons – was focused on with such unflinching and uncensored intensity that a whole new dimension was added to the horror film. True, Satan was a popular figure in the movies going all the way back to the silent “Haxan”, but never was he (or his lieutenants) portrayed in such shocking detail. All that the recent “Rosemary’s Baby” hinted at, “The Exorcist” shoved directly in the viewer’s face. The movie was a huge sensation and changed the whole landscape of horror. And its reputation was well-earned. 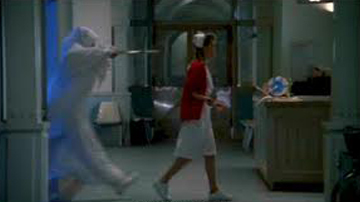 But your fiendish friend, The Good Doctor, will go out on a limb (as he frequently does) and say that its sequel once removed, “Exorcist III”, may be an even more unsettling look at demonic evil. Where the malignancy was confined to poor Regan McNeil in the original film, in “Exorcist III” it seems to be everywhere, in nursing homes, in hospitals, even in the confessional booths of the Catholic Church. “III” is on the surface not as up front and visceral as the original, but it lingers in my mind much more. I’ve seen many, many horror films in my depraved existence, but this one exudes a uniquely spiritual evil that’s unlike any other movie. We’ll take a much closer look at that malice in a bit, but first, a brief look at the torturous path this film took to its release. Following the smashing success of “The Exorcist”, it was only natural that Warner Brothers wanted a sequel. However, director William Friedkin and original writer William Peter Blatty were dead set against the idea and strongly opposed it. Warner Brothers went ahead anyway and hired highly touted British director John Boorman to helm the sequel. Boorman was an extremely talented but erratic personality whose work ranged from the Oscar-winning “Deliverance” to the oddball and poorly received sci-fi epic “Zardoz”. Boorman’s sequel became “Exorcist II: The Heretic”, starring Richard Burton as a cynical priest who is called upon to once again exorcise the Assyrian demon Pazuzu from a now-teenage Regan McNeil (Linda Blair again). “Exorcist II” was ambitious in conception but a nightmare in realization. The disjointed, surrealistic picture has been cited as one of the worst major studio productions ever and, in fact, the Medved Brothers had it rated second only to Ed Wood’s “Plan Nine from Outer Space” as the worst movie of all time in their book “The Golden Turkey Awards”. Critics had a field day criticizing the movie, especially the outrageous performance of an obviously inebriated Richard Burton. The financial and critical failure of “Exorcist II” put the kibosh on any further Exorcist activity until 1983 when Blatty wrote a sequel entitled “Legion”. This would later become the basis for “Exorcist III”. Ignoring everything in “Exorcist II”, “Legion” had a much different tone and narrative than the original “Exorcist” story, focusing on how Lt. Kinderman finds a connection between a series of gruesome murders and the Regan McNeil exorcism case. Blatty led the charge to film “Legion” and invited Friedkin to again helm the movie. However, Friedkin rejected having anything to do with an Exorcist-related project, especially after the debacle of the second film. For a time, John Carpenter was considered as a possible director before Blatty himself decided to bring “Legion” to life. But from the very beginning, Blatty clashed with Morgan Creek Productions over the concept of the film. 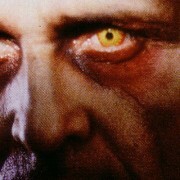 Morgan Creek insisted on having the word “exorcist” in the title for commercial reasons while Blatty wanted it filmed as “Legion”. In the end, the studio got its way. That would not be the last of the changes they would inflict on the movie. In 1976, Lee J. Cobb, who originally played Lt. Kinderman, passed away, necessitating a change in actor. They could not have found a better replacement: George C. Scott took Cobb’s spot. The choice was inspired. Scott brought an emotional grittiness and intensity to Kinderman that even Cobb would have found hard to match. Scott’s portrayal ranges from brittle humor to intense weariness and to bristling rage. He’s the anchor that holds the real-world aspect of “Exorcist III” in place. No doubt, many studio suit-and-ties probably called for a younger, more “bankable” star, but Blatty stuck to his guns and Scott remained. The movie opens in Georgetown, Maryland exactly 15 years after the exorcism of Regan McNeil. Police Lt. Kinderman is mourning the death of his friend, the priest Father Damien Karras, who was involved in that exorcism. On that anniversary, the world-weary Kinderman is also investigating a crime of unspeakable evil. As he tells his comrade, Father Dyer (Ed Flanders, excellently cast), a young black boy from the Boys Club has been decapitated, his head replaced by a stone bust of Jesus painted in blackface. The boy was also crucified on a pair of rowing oars. Kinderman’s deadpan recitation of this atrocity and Dyer’s unspeaking response is a chilling example of what makes “Exorcist III” work. We almost never see blood and mayhem, but the gruesome details of shocking acts are related with sober realism. We sense throughout the film that Kinderman, a loving family man, is struggling with spiritual horror. Her voice rises to a demonic cackle as we see a look of fear on the priest’s face. Quick cut to a body covered by plastic and Lt. Kinderman in the church. Father Kanavan’s head has been found in the baptismal fount. The killer has struck again. This is great direction, great movie-making. Kinderman has noticed an even more unsettling detail in the killings of the young boy and the priest. On their hands has been carved the zodiacal sign of Gemini. This was a trademark of The Gemini Killer, a serial killer who left a bloody trail of victims in his attempt to embarrass his evangelist father. It is also a detail that was kept deliberately secret by the police. The catch is: the Gemini Killer was caught and executed many years ago. At almost the same time that Father Damien Karras cast out a demon from the body of Regan McNeil. More details arise. The killer used a very rare drug to paralyze his victims while he committed atrocities on them, meaning they were alive during the time they were cut up and mutilated. Kinderman traces the drug supply to a nearby hospital, where the drug is in the possession of the department dealing with severely violent cases. Also, fingerprints at the killings seem to belong to two different people. As the lieutenant begins amassing more facts, the horror hits home, as someone very close to him is horribly killed by the same fiend. 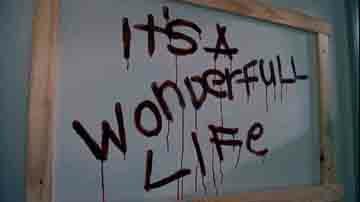 This time, a message is left for Kinderman, written in the victim’s blood: “It’s a Wonderfull Life”. The doubling of the “L” is another trademark of the Gemini Killer. Kinderman begins to feel his sanity draining away as overwhelming evil makes its presence known. When the lieutenant visits the psych ward for extreme cases, he learns of a mystery inmate known as “Patient X”. To his shock, “Patient X” seems to resemble Father Damien Karras. Dr. Temple, head of the psych ward, reveals that Patient X was found wandering with no memory 15 years earlier. At exactly the same time Father Karras supposedly died. Patient X was mostly quiet and docile until recently, when he awoke from catatonia and became violent, saying he was the Gemini Killer. 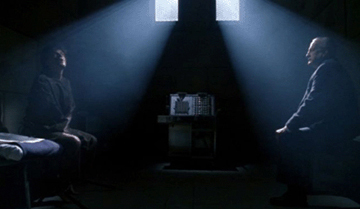 Kinderman takes the dangerous step of interrogating Patient X on his own. This is where the movie has its most intense scenes. Patient X does indeed seem to physically be Damien Karras (Jason Miller, who played Karras in the original, returned to the role), but his personality and memories are those of the deceased Gemini Killer. Patient X seems to switch between the body of Karras and the actual Gemini Killer (Brad Dourif) as Kinderman watches. His description of draining all the blood out of a victim’s body without spilling a drop is also sure to make the listener queasy. Again, we don’t actually see the violence, but the description is so detailed and matter of fact, we feel as if we’ve witnessed something truly horrible. A fascinated and repulsed Kinderman learns more of what’s behind the murders. It seems that after the Gemini was executed 15 years before, his spirit was intercepted by a malevolent demon just cast out from the body of a young girl. Recognizing a kindred spirit, the demon decided to use the Gemini to enact a diabolical revenge. It placed the serial killer’s spirit in the just-dead body of the holy man, using him as a vessel. Due to Karras’ actual death, it took almost 15 years for the Gemini to learn how to totally come to the surface and control Karras’ body. That time is now. With Karras’ soul screaming helplessly in the prison of his own flesh, he witnesses the Gemini using his body to commit unspeakable murders. Using the power of his demonic master, the Gemini can possess the bodies of helpless Alzheimer’s patients and use them to commit murders. No one would suspect a senile oldster of horrible mutilation murders. This is also the reason why the fingerprints are different at every crime. The victims are specially chosen to cause the most horror and pain to Father Karras, many involved with the original McNeil exorcism. The Gemini now has some additional information for Kinderman. To show his absolute power, he will kill another innocent in the hospital and then target the lieutenant’s own family. After striking Patient X in uncontrolled rage, a fearful Lt. Kinderman begins to research the rites of Catholic exorcism. Meanwhile, we see another Catholic priest, Father Morning (Nicol Williamson), make preparations for an exorcism after experiencing signs and evil omens. When the Gemini Killer strikes the next time, it results in one of the most masterful and terrifying scenes in modern horror. This is the “hospital corridor” scene. I’ll let you experience it for yourself. This is a beautifully directed symphony of quiet suspense that explodes with a tenth of a second of shock that has a lot of viewers jumping out of their chairs. It’s a real masterpiece by Blatty and I sincerely doubt if Friedkin or John Carpenter could have done any better. The conclusion of the film has ignited powerful debate since the movie’s release. The studio demanded that an actual exorcism be included in the film, as well as a good deal of blood and special effects. Blatty’s original treatment had none of this. The story was one of unnerving atmosphere and profound horror coming from the imagination rather than something blatantly in your face. Of course, this approach to film-making is about as popular as a fart in a car amongst the bean-counting suit-and-ties who run Hollywood. So Blatty gave in to the studio again and agreed to the insertion of Father Morning’s character into the film. Even casual viewers can detect that Morning was tacked on to the movie at the last minute. Nicol Williamson, an excellent actor, was wasted in a part that was virtually mute. He was around long enough to offer the obligatory exorcism as well as a gruesome scene where his skin seems to split open due to the demon’s interference. Also during the final confrontation, we have a glimpse into Hell itself and what seems to be the visualization of the horrific murder of the young black boy. It’s a creepy scene, but it can again be debated that it was not necessary to the final denouement. Another bit of oddness is a peculiar dream Kinderman has early in the film, where he walks through what seems to be a train station serving departed souls to heaven. 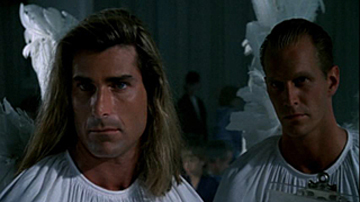 Not only does the lieutenant have a casual conversation with the murdered boy, but he also encounters basketball star Patrick Ewing and male model Fabio as angels. Look carefully for a bit appearance by Samuel L Jackson before he hit it big. The dream sequence seems to be Blatty’s idea, not the studio, and while it’s not strictly necessary, it adds a further touch of weirdness to the proceedings. “Exorcist III” was by no means a hit in the theaters when it was released. Unfortunately, the studio’s belief that the mass audience had no interest in downbeat atmospheric horror with an aging star heading the cast seemed to be borne out. But the film got some excellent reviews and as time has gone by, it has acquired the reputation of being something fresh and different. 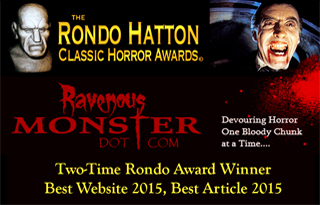 Some reviewers, including your humble servant, even believe it to be superior to the original “Exorcist”. If Blatty’s vision had been uncompromised, it’s likely the film would have been better yet. Brad Dourif and producer Carter DeHaven have made statements saying they believed that to be the case. But fortunately, enough of Blatty’s concept remained intact to make “Exorcist III” not only an effective horror movie, but a rare sequel that matches its predecessor. I highly recommend it!